😝 Squinting Face With Tongue Emoji is a funny face with squinting eyes and and its tongue out mostly expresses a humorous reaction like a LOL. Often used to annoy someone and to show arrogant superiority in something, but sometimes used in really offensive messages. However, this is a generally positive smiley widely used for joking and laughing. 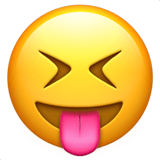 Squinting Face with Tongue Emoji was approved as part of Unicode 6.0 standard in 2010 with a U+1F61D codepoint, and currently is listed in 😀 Smileys & Emotion category. 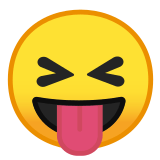 Use symbol 😝 to copy and paste Squinting Face with Tongue Emoji or &#128541; code for HTML. This emoji is mature enough and should work on all devices. You can get similar and related emoji at the bottom of this page.